This was my very first request! Thanks to Dumas for the idea! As you can see, I decided to add a certain few special fishes to the scene... I really enjoyed this, and if anyone else ever wants to make a request, feel welcome to! Inked with markers and colored with good ol' Crayolas! Oh wow! This is amazing. I like your drawing style. The way you shade is very smooth, and so is your coloring in general. I like the way you have their bodies laid out... It really looks like they're floating around in water. Thank you so much! It's a little difficult trying to make them look essentially weightless, but I'm glad it looks right! wow, well done, it looks very original and pretty. Sora's expression is funny LOL. I like how you drew their bodies, it's a good job on anatony. Are those fishes the characters from Finding Nemo? LOL. I also like the background because it looks beautiful with all thoose details. Thanks so much!!! I have only taken one art class and it was a joke (high school art 1...don't really learn any techniques...). I try really hard to get bodies proportional and natural-looking as best I can.. I guess I am going through body movement experimentation... And yeah, they are the fishies from Finding Nemo... managed to weasel my love for the ocean into the pic. 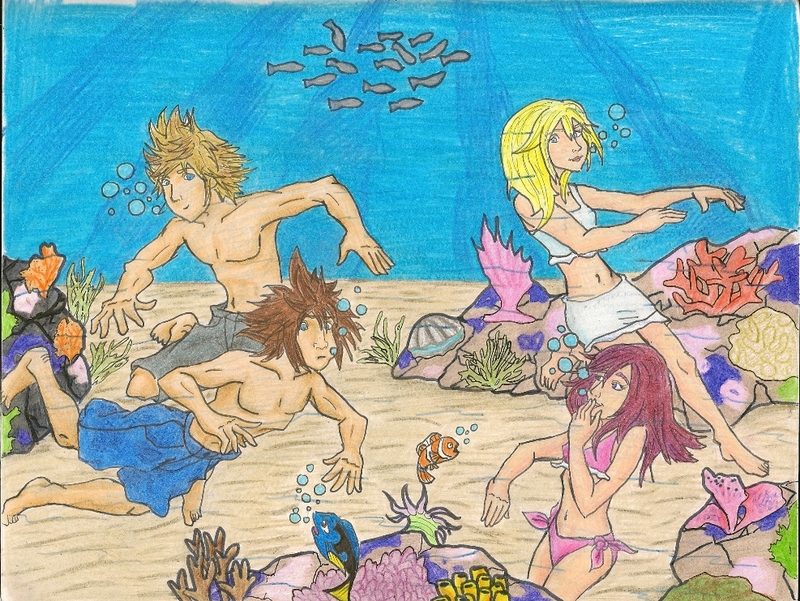 = ) Sora looks like that cuz he got scared by the fishes... everyone else is pretty much laughing at him.